Placing a Landscape Art Solution like a sculpture can provide your space with multiple characters. Nothing can bring out the sense of charm like sculptures. A dynamic Landscape Art Solution like a sculpture can really show off one’s personality. Sculptures can make statements about your yard. Sculptures reveal your sensibilities and tastes. There are sculptures with different functionalities. A few sculptures are integrated as parts of fire pits, fountains, lamps, etc. One can use different forms of sculptures as ways to add some extra allure to the space. One can even get a large-sized sculpture as for the center of the garden. Unique or abstract sculptures work very well for a dead land and can become the focal point for the space. 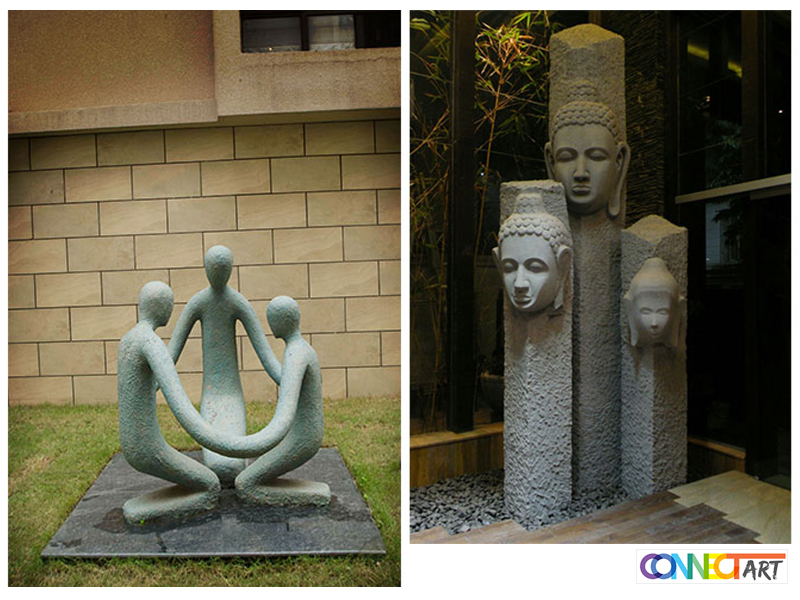 Expressive Medium:- Sculptures help to express your personality through your yard or garden. Great Option for the Art Lovers:- Gardening is an art. If one loves art and desires to showcase art throughout the home, sculptures can be the best choice to apply the art love to the indoor as well as to the outdoor spaces. Detract from the Nature:- A few sculptures forms exhibit a natural feel. These types of sculptures can include natural lines and textures but are actually manmade products. If one is thinking of making the plants the center of attraction, sculptures can detract away from their sway. A sculpture tends to grab the eyes of many and tends to be the focal point of an area. There are so many forms of sculptures that look amazing in the garden area or yards. If one is searching for a small accent sculpture one can get it done by investing a small amount. One can find fascinating sculptures at the antique stores too. Keep your eye out for the sculptures that is sure to go well with your space. If one desires for a custom sculpture then also one can get in touch with the top Sculpture Manufacturer in Kolkata. There are nothing like the customized sculptures to accentuate the garden area of your house. One can use the outdoor sculptures for expressing several things. If one has spiritual leanings or loves cultural artworks then one can go for the sculptures that will help in reflecting these interests. Several sculptures use the natural shapes. These types of sculptures are usually made in the shape of flamingos. These sculptures use the action lines and the shapes of flamingo to guide the gaze of the observer through the space. Sculptures are made up of several materials like stone, ceramic, metal, wood, etc. Some of the statues can add a dash of class and sophistication to the fountain of your garden or your yard. Some modern carvings have sleek and interesting appeals. The hardy and sturdy designs are capable of withstanding the elements and remaining as parts of the landscape for longer time. Some of the carvings are designed for creating intrigue in the mind of the viewer. Sculptures that are made from rocks or stones are extremely hardy and durable and look natural too. Placing stone sculptures in the yard or garden area can be a great way to bridge the gap between the constructed features and the natural ones. Animals are one of the classiest subjects for the sculptors. Mythological beasts and fantasy creatures always stand as the fascinating sculptures. What One Thinks About Garden Ornaments or Sculptures? We promise to get back. © 2017 Connect ART. All rights reserved.